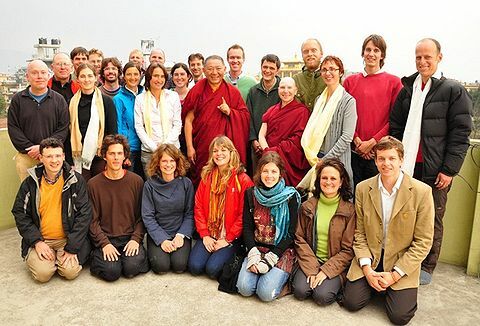 On 23 February 2010, the Rigpa shedra was invited to meet with Ringu Tulku Rinpoche in Kathmandu. After diverse adventures and teachings throughout Nepal during the Losar break, the shedra students had also enjoyed an audience with Sogyal Rinpoche and Khenpo Namdrol Rinpoche earlier that day. The group then met for lunch at Shechen Gompa and made their way along winding lanes behind the holy stupa of Boudhanath to Ringu Tulku Rinpoche’s house. They were greeted initially by barking dogs, friendly youngsters and other signs of normal family life. In his shrine room at the top of the house, Rinpoche gave the shedra group a warm and gracious welcome. Shedra students presented some of their most burning questions, which Rinpoche addressed with profound simplicity and humour. This page was last edited on 15 July 2010, at 22:07.